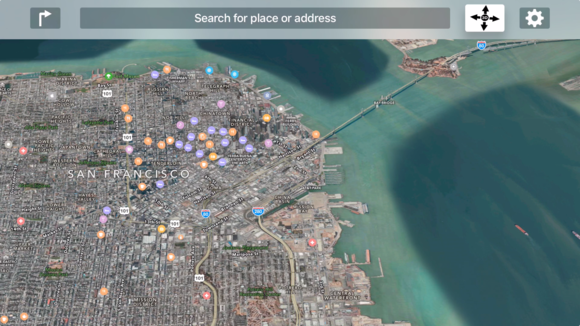 A simple app lets you see Apple Maps street and satellite views, view directions, and has a nifty screensaver-like flyover. Instead of squinting at a map on your phone, why not take a look on a big screen you already own—an HDTV set via your Apple TV? The appropriately-named Arno Appenzeller—really his name—used the MapKit part of tvOS to create an interactive app called TV Maps. At $2, it’s a treat. Because it relies on MapKit for mapping, rendering, and directions, TV Maps is also subject to some artifacts of this implementation, which include noticeable delays in loading map segments, and an odd stutter during 3D rotation in a special “flyover” mode. But tvOS handles maps generally fine, and as it matures, TV Maps will get “better” as a result. Times Square shows to great advantage with labels attached. It feels fairly intuitive to swipe around to move the map in various directions, and then slide to zoom in and out. It’s not quite as comfortable as using an iPhone or iPad, of course, but you don’t need to teach yourself a new set of conventions. Maps load reasonably fast, but it appears that tvOS isn’t optimized to load and cache quite as well as iOS. 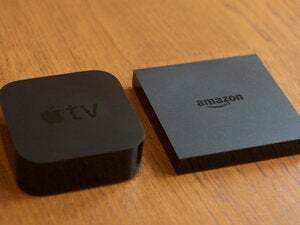 With the fourth-generation Apple TV’s relatively zippy processor, and with my model connected to our home’s gigabit Internet connection, TV Maps often had empty “holodeck-style” grids that I waited for a second or a few to populate with map imagery. This was much slower than similar-resolution performance on both a new iPhone 6s (at a lower overall display resolution) and an older Retina iPad that shows many more pixels than a 1080p display. Hold down the touch button, and you can access directions and locations, plus settings and a neat, slightly hidden feature. Tap the entry field for a location or tap the direction icon to enter a starting and ending spot. Directions let you see the scope of a path and view alternatives. While a 1080p HDTV has less resolution than nearly any modern desktop display, it’s still pretty nifty to see the detail filling the larger area of an HDTV. It’s especially nice if you’re trying to show multiple people a route, or want to show a satellite or 3D image view to your family. The entry fields have the same limitations for entering text as every party of tvOS. I found myself swapping back and forth with my iPhone running the Remote app to bypass the wide-alphabet keyboard that tvOS still limits us to. While TV Maps uses autocomplete to fill in places names, for specific streets addresses and names that Siri doesn’t recognize perfectly, it can be easier just to tap the the details. This makes it slightly awkward, but it’s not bad. 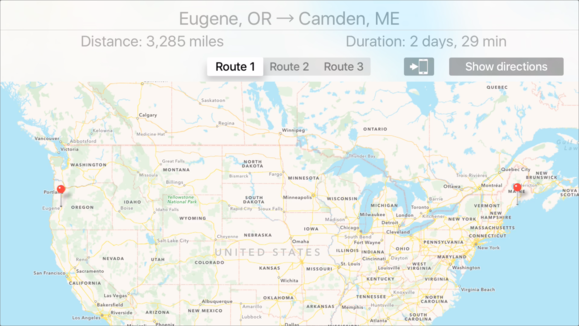 TV Maps can use tvOS’s voice dictation to enter place names and addresses. 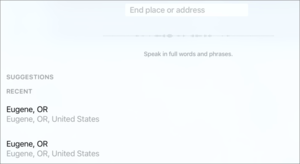 The entry field also lets you dictate with a Siri Remote, and that generally worked well, as the dictation matches against Apple’s own directory of place names. However, you probably haven’t seem many things as funny as an eight-year-old yelling “Burj Khalifa!” at a Siri Remote, which determinedly tried to show him things other than the tallest building in the world. After several tries, we got there. The weakest part of TV Maps is how it displays turn-by-turn directions, which enlarges every segment to fit the same screen size. While this is a built-in function of MapKit, it doesn’t work well on the big screen, and it’s definitely an area for the developer to put more custom effort. The tvOS interface also suffers from places in which a developer has used multiple buttons, only one of which should selected. A slow swipe over lets you choose among them, and a fast one skips them by, as in choosing among route alternatives in TV Maps. I eventually mastered not switching routes to move around that view, and, again, Apple can make this better in a way a developer can’t. 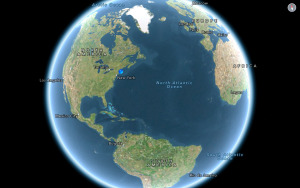 If you select 3D in the location bar, you can rotate and cant the angle of the display, but I found in adjusting the angle, it was very easy to zoom out all the way to a full-globe view. In talking with the developer and by testing, it’s quite clear this is an issue with MapKit in tvOS, and Apple has to make improvements to sort it out. The hybrid view is particularly compelling for panning and zooming. There’s a sort of Easter egg in TV Maps. Press and hold the touch button and then select the settings (gear) icon, and you can choose Flyover Demo. This is a sort of screensaver that takes you from your current location, zooms out to the global level (with MapKit’s simulation of night and day parts of the Earth), and then flies you down to one of several preselected landmarks. The app spends a few minutes rotating the view of a castle or building, and then takes you the next destination. It’s nifty, although MapKit’s loading time and 3D rotation hiccups can make it a little less so at times; yet another feature that tvOS maturity will improve. TV Maps pairs with a very stripped-own iOS app that lets you pass directions you’ve selected on the Apple TV to an iOS phone, which then can open the Maps app in iOS. The apps are bundled so that you can purchase the pair either via the iOS or tvOS App Store and get the complementary app. 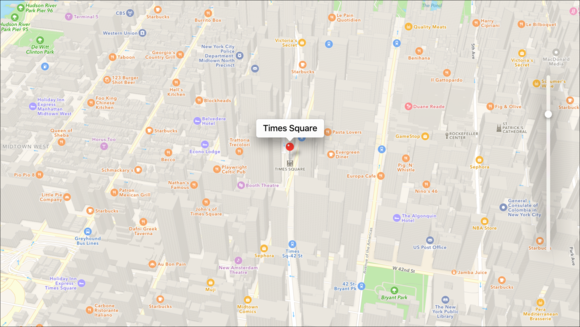 While TV Maps isn’t a shattering, landmark use of tvOS, it’s useful and fun. If you have children who like exploring virtual streets or the planet, it’s a particular joy that lets them plot their own journeys.